The Force.com platform implements the OAuth 2.0 Authorization Framework, so users can authorize applications to access Force.com resources. When you configure the Coveo Salesforce security provider and Salesforce source, you must know the Client_ID and Client_Secret token values for the Salesforce organization that you want to index. Using and administrator account, log into the Salesforce organization that you want to index. On the User Menu, select Setup. In the navigation menu on the left, under App Setup, expand Create, and then click Apps. 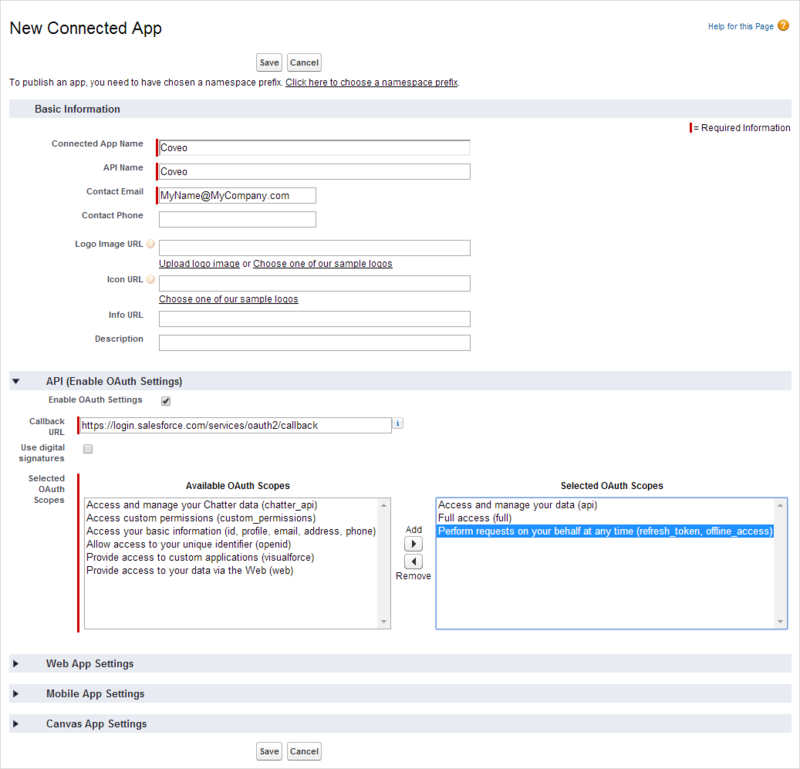 In the Apps page, in the Connected Application section, click New to create a new application that will use OAuth2 to gain access to the organization. Enter meaningful names in the Connected App Name and API Name boxes. Enter your email in the Contact Email box so that you can receive messages from this application. Select the Enable OAuth Settings check box. In the Callback URL box, since a callback URL will not be used for this application, enter a dummy but valid secured URL (https://) such as https://login.salesforce.com/services/oauth2/callback. and click Add for each so that they appear in the Selected OAuth Scopes list. Copy the Consumer Key value and paste it in a secure reference document of your choice. The Consumer Key is the client_id. Next to Consumer secret, click Click to reveal, copy the value that appears, and then paste it in your secure reference document. The Consumer secret is the client_secret. Note: You can always come back to this Salesforce page (Setup > App Setup > Create > Apps, and clicking the application name in the Connected Apps list). 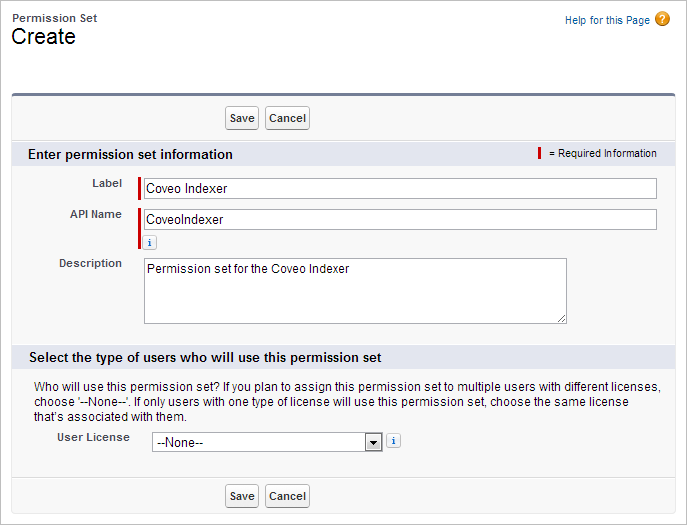 In the Setup page, select Manage Users > Permission Sets. In the Permission Sets page, click New. In the Create page, in the Label and API Name boxes, enter significant names, and then click Save. 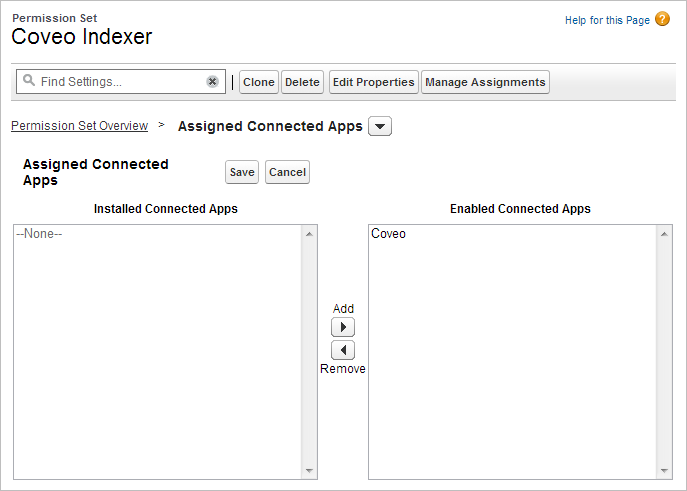 Click Manage Assignments, and then add the dedicated user you created earlier for the Coveo crawler (see Creating a Dedicated Salesforce Crawling Account). In the Apps section, click Assigned Connected Apps. In the Assigned Connected Apps section, click Edit, add the connected app you just created to the Enabled Connected Apps list, and then click Save. Create an ObjectsToGet Configuration file (see Salesforce ObjectsToGet Configuration File).